Named for the silky look of its skin, the silky shark tends to be long and slender, with slightly shorter dorsal fin (top), and elongated pectoral fins. This is one of the most abundant sharks of the pelagic zone (open water away from shore and surface), and is usually not considered a threat to humans because few people enter its territory. It feeds on schooling fish, particularly favoring tuna, and are intensely sensitive to sounds, possibly to follow the sounds of other animals feeding. The silky shark, so named because its “smooth” hide (a result of densely packed dermal denticles) is also called the “net-eater shark” in the eastern Pacific because of its tendency to ravage tuna seine nets. Other English common names include blackspot shark, grey whaler shark, olive shark, reef shark, ridgeback shark, shark, sickle shark, sickle silk shark, and sickle-shaped shark. Internationally, this shark is commonly referred to as cação (Portuguese), cazon (Spanish), cazon de playa (Spanish), cazón-tiburón (Spanish), haukkahai (Finnish), jaqueta (Spanish), jaqueton (Spanish), kanhaai (Dutch), karcharinos lios (Greek), kurotogarizame (Japanese), lombo preto (Portuguese), malie (Samoan), mandi sravu (Malayalam), mangeur d’hommes (French), marracho sedoso (Portuguese), marracho-luzidio (Portuguese), mbamba menyo (Swahili), moosi (Gujarati), mungsing (Javanese), mushi (Marathi), papa (Swahili), papa bunshu (Swahili), pating (Tagalog), requin soyeux (French), seidenhai (German), suga sura (Telugu), syhaai (Afrikaans), tiburón (Spanish), tiburon jaqueton (Spanish), tiburón lustroso (Spanish), tiburón sedoso (Spanish), tinterero (Spanish), tollo (Spanish), tollo mantequero (Spanish), tribon berde (Papiamento), tubarão-luzidio (Portuguese), yu jereh (Malay), yu pasir (Malay), and zijdehaai (Dutch). 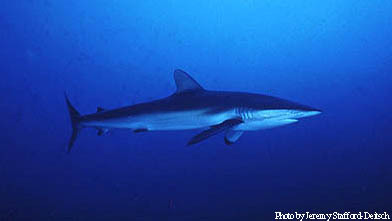 The silky shark is of considerable importance to longline and gillnet fisheries in many parts of the world. 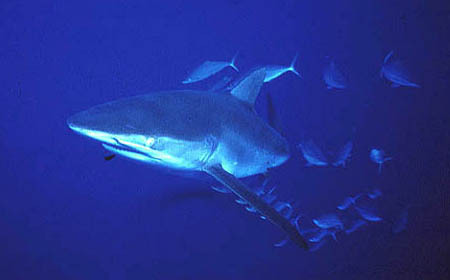 In the Gulf of Mexico it is often caught as bycatch in the tuna fishery but also harvested by the directed shark fishery. In the Caribbean it is sometimes fished, primarily by longline, but is not a common catch. In the Maldives and Sri Lanka, it is the most important shark species, comprising 70-80% of the pelagic longline catch. In Japanese waters, the silky shark is commonly taken in the directed pelagic shark fishery but also in the swordfish and tuna fishery as bycatch, while around the mid-Atlantic coasts of the United States, it is fished but not in significant numbers. It is used for its meat, oil, and fins. 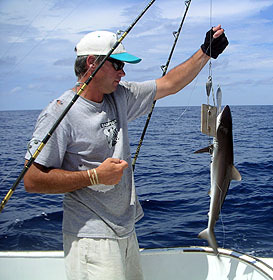 The silky shark is also taken by recreational fishermen. Other than its importance to various fisheries, the silky shark has been used in various scientific studies investigating the sensory biology of sharks. This species is considered potentially dangerous to people primarily because of its size. Its oceanic habits make contact with humans a relative rarity, however, it has been implicated in a few attacks. The silky shark has been observed with head raised, back arched and tail lowered, a posture believed to be a form of threat display. As with other sharks, the silky shark is vulnerable to over-fishing due to its long gestation period, low number of offspring and slow growth rate. > Check the status of the silky shark at the IUCN website. The silky shark is a common tropical-subtropical, epipelagic species that occurs in the Atlantic, Pacific and Indian oceans. In the western Atlantic, it ranges from Massachusetts to Brazil (including the Gulf of Mexico and Caribbean Sea) and from Spain to Angola in the eastern Atlantic. It is found in the western Indian Ocean and the Red Sea from Tanzania to Mozambique, including Madagascar and the Comores and in the mid and eastern Indian ocean from the Maldives and Sri Lanka to western Australia. It occurs from China to New Zealand in the western Pacific (including the Hawaiian Islands), and the western and southeastern and Baja California to Peru in the Eastern Pacific. Although essentially pelagic, the silky shark is not restricted to the open ocean and has been recorded from depths as shallow as 18 meters (56 ft). 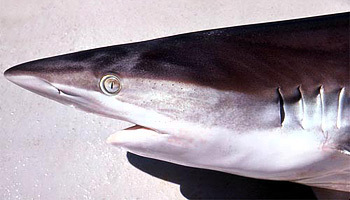 It is an active, swift shark that prefers warmer water (about 23°C). It is commonly found near the edges of continental shelves and over deepwater reefs where there is abundant food source. Typically, it ranges from the surface down to at least 500 meters (1,550 ft) but has been caught over water as deep as 4000 meters (12,400 ft). Studies show no strong tendency for sexual segregation in the silky shark however, they often travel with others of their own size indicating that size segregation is present within the species. Typically, smaller sharks can be found in coastal nurseries and adults further offshore over deeper water. 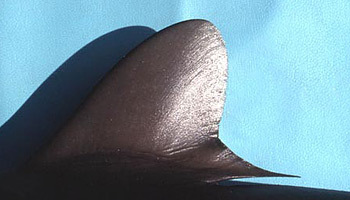 Small silky sharks are commonly associated with schools of tuna. Dark gray with a bronzy tint dorsally and white ventrally. Tips of fins other than first dorsal dusky, more conspicuous in juveniles. Upper teeth broadly triangular and oblique becoming more diagonal toward the angle of the jaws, strongly notched laterally, heavily serrated on both sides (slightly more basally). Lower teeth erect with smooth edges. Usually 1 or 2 symphysial teeth in both the upper and lower jaws. Denticles are small, tightly packed and over-lapping giving the hide a smooth or “silky” texture, hence the common name. Maximum length for this species is 3.3 m (10 ft). Males mature at 215-230 cm (9-10 years of age) and grow to a lesser size than females, which reach maturity at 230-245 cm (12 years of age), however, these numbers may vary by population. For example, populations in the Pacific and Indian oceans generally have a smaller size at maturation. Size at birth is 70-85 cm (2-2.5 ft). Maximum age is believed to be 22+ years. This species feeds primarily on a variety of bony fish, cephalopods, and to a lesser extent, crustaceans. Tuna (little tunny and yellowfin), albacore, mullet, mackerel, porcupine fish, squid, nautiluses, and various crabs have all been found in the stomachs silky sharks. Reproduction is viviparous (placental). In the western North Atlantic, females give birth in late spring (May-June) and mate around the same time in alternating years. The gestation period is about 12 months. Number of sharks per litter is 6-14 in the western Atlantic, 9-12 in the eastern Atlantic, 9-14 in the western Indian, and 2-11 in the central Indian. Neonates spend first the few months in near reefs but move to the open ocean by the first winter. 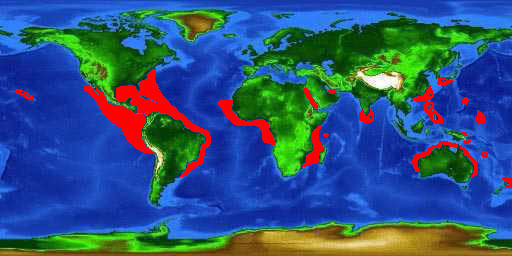 In the western North Atlantic, nursery areas are located along the Caribbean islands. The first specimen described was given the name Carcharias (Prionodon) falciformis by Müller & Henle in 1841. The genus name Carcharhinus is derived from the Greek “karcharos” = sharpen and “rhinos” = nose. Other names appearing in the literature include Squalus or Prionodon tiburo, Gymnorhinus or Gymnorrhinus pharaonis, Aprionodon sitankaiensis,Carcharhinus floridanus, Eulamia malpeloensis, and Carcharhinus atrodorsus.